(L-R) Marc Anthony, Chayanne and Marco Antonio Solis brought down the house at the GIGANT3S finale in Las Vegas this weekend. Billboard Magazine announced this week that GIGANT3S, the U.S. music tour starring Marc Anthony, Chayanne® and Marco Antonio Solis and produced by Chicago-based Cardenas Marketing Network (CMN), occupied the No. 1 spot in Billboard’s Hot Tours Chart with over $10 million in ticket sales. The 14-city stateside trek kicked off Aug. 3 at Miami’s American Airlines Arena and concluded this weekend, as the pop legends performed before a full house at the Mandalay Bay Resort in Las Vegas. GIGANT3S rules Billboard’s Hot Tour Chart, leaving Jason Aldean at No. 2, Maroon 5 at No. 3, Rascal Flatts at No. 4 and Mumford & Sons at No.5. 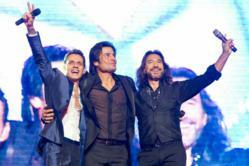 CMN is now preparing for the Latin American tour of pop icons Chayanne and Marc Anthony beginning Sept. 26. This week’s ranking complements other accolades for CMN in 2012, including its “Best Tour Sponsorship” Award from Billboard and its selection into Event Marketer Magazine’s “It List”, Chief Marketer’s “Top 100” agency list, Hispanic Business’ “HB 500” list, and Crain’s Chicago Business’ “Fast Fifty” list for the third consecutive year. Founded in 2003 by Henry Cardenas, Cardenas Marketing Network (CMN) is an independently owned, multicultural event marketing and sponsorship agency that creates brand impact through award-winning campaigns featuring concerts, sports events and other interactive experiences that capture the hearts and minds of millions of target consumers across the nation. In 2011, CMN produced more than 2,500 live events, including music tours, experiential campaigns and mobile marketing tours for clients such as Wrigley, Anheuser-Busch, McCormick, H&R Block, General Motors and Goya, among others. With offices in Chicago, Los Angeles, Miami and New York, and a dynamic, results-driven team, CMN applies strategic thinking and flawless execution to deliver value for clients anywhere in the nation.